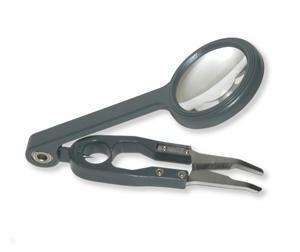 Carson OD-99 Fish'nGrip is a compact magnifier combined with a 3-in-1 fishing tool. Built-in serrated "sure-grip" tweezers, precision fishing line clippers and handy hook-eye cleaner makes this the "must have" tool for all fishing enthusiasts. Its crystal-clear acrylic lens lets you see the finest details with ease. keep this handy fishing tool magnifier in your tackle box. For your convenience the Fish'nGrip comes with a protective pouch. 4.5X Magnification.